Working in teams, making sense of information overload, and managing limited resources—huge tasks that require thoughtful management . This is an excerpt from a longer paper written as part of my MA in Digital Experience Design at Hyper Island in the UK. From flat to Lean to Holacracy, there are a whole lot of buzzwords out there in the wide world of management. This article gives a brief survey of a few popular ones, with some case studies and a critical reflection on each. A flat team structure is just what it sounds like — no seniors, no juniors — everyone’s seniority and decision-making ability is considered equal. Several organizations have been working with this and sharing their successes and failures publicly. One organization well-known for its use of flat structure is Valve, a gaming company in California. 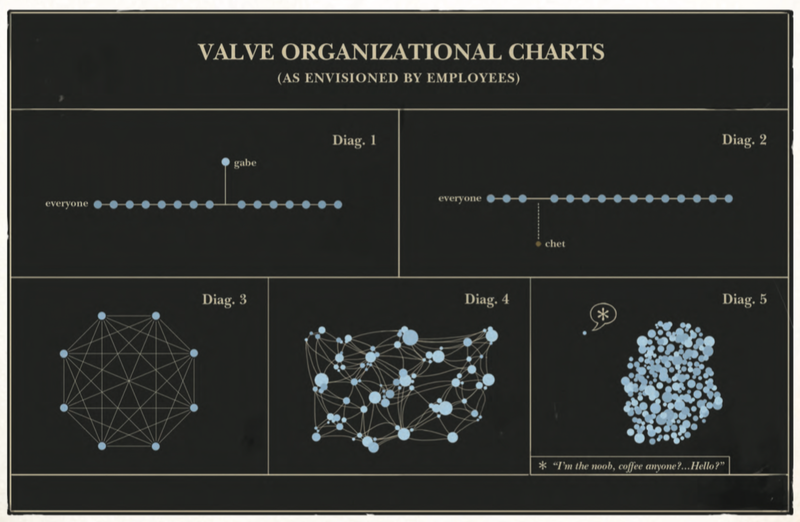 They published an employee handbook which has become somewhat of a how-to guide not only internally, but for other organizations seeking to adopt a flat approach (Valve Software, 2012). Figure 2. At Valve, answers don’t come from “above.” It’s up to employees to define their own structures and processes. Early on…everyone dabbled in every decision. Anyone could share their two cents on any project, and we were collectively on the lookout for opportunities to improve…I ultimately acted as a bottleneck for major decisions…We began to realize that by building a company with a flat org structure, we had done the exact opposite of what we had intended. We had centralized all the decision-making, and we were relying on a secret implicit structure to make progress (Savage, 2015). In the early years of the company, a flat structure served the team. However as the company grew, it no longer worked. This example illustrates why a team should not adopt one management technique and consider the decision final and indefinite. As a company grows and evolves, different frameworks will prove themselves to be optimal at different times. Holacracy is a highly codified, formalized method of managing a team, complete with its own LLC, Constitution and registered trademark (thus the capital ‘H’). According to Brian Robertson, who created the method, Holacracy is “a new social technology for governing and operating an organization” very different from the familiar command-and-control style of hierarchy (Robertson, 2015). Figure 3. Advantages of Holacracy according to HolacracyOne LLC. What makes it different? The image above gives a sense for the types of frameworks Holacracy defines. For example, specific guidelines for running a meeting, giving individuals “roles” instead of “job titles.” This is intended to distinguish actual tasks from personalities and politics. Holacracy also distributes decisionmaking authority throughout the organization, and uses short one-month cycles of evaluation and organization to continually optimize the team structure (HolacracyOne, LLC, 2016). Circle/Sub-Circle/Super-Circle — A collection of roles relating to a given purpose. Individuals who take these roles are called “members” of the Circle. Sub-Circles may be formed by any Circle as needed to fulfill its purpose, making the original circle into a Super-Circle. Lead Link/Rep Link/Cross Link — A Lead Link is a Partner in a Circle whose Role is synonymous with the Purpose of that Circle. Despite being accountable to the Circle’s main Purpose, the Lead Link may not make decisions outside the Circle’s Governance process. Rep links liaise between Sub-Circles and Super-Circles, and Cross Links liaise between circles that are otherwise unrelated. Governance — The process used by each Circle to autonomously define its own rules and processes as a collective. Tension — the gap between “current reality and a potential you sense.” Partners are responsible for finding and attempting to resolve the tensions blocking their ability to fulfill their role(s). Medium, the popular blogging service, recently abandoned Holacracy and published a thorough and thoughtful explanation for this choice on their blog. The company found Holacracy’s procedures and rules too rigid. In the words of Medium’s Head of Operations, Andy Doyle, “the system had begun to exert a small but persistent tax on both our effectiveness and our sense of connection to each other” (Doyle, 2016). Since quitting Holacracy, Medium now manages its teams with a management method they’ve designed themselves, which they expect will allow for the flexibility and customization that they need. Today, “lean” management principles are used in all kinds of organizations from web design agencies to soup kitchens. The methodology itself, interestingly, has its origins in car manufacturing. Figure 4. Sample workflow improvement created under the Toyota Production System. Many small improvements can significantly boost productivity over time. In the 1990s, the Toyota factory floor operated in a completely different way from its American and European counterparts. In the West, car manufacturing plants touted the mantra, “don’t stop the line,” meaning that workers should never interrupt the car assembly process, since interruptions meant fewer cars produced per day, and productivity was the goal of the factory. This perpetual motion approach to car assembly meant that production errors like backwards seats and missing door handles made their way all the way through to the end of the line, where the mangled cars were usually discarded. Toyota, on the other hand, was using kaizen, a philosophy of continuous improvement and cleanup. In practice, what kaizen meant for Toyota workers was that their creative input on processes and procedures was not only allowed, but expected. This input was shared not at weekly or monthly staff meetings, but rather in the heat of the moment, right on the factory floor. The car assembly line could be physically stopped at any moment by any worker who felt that he or she had an idea to improve some aspect of the process, like moving tools to a lower shelf, or catching metal filings in a container instead of sweeping them. To give feedback, the worker pushes a button or pulls a cord called andon, and shares their suggestion with a supervisor (This American Life, 2016). Bringing the entire factory to a halt created significant interruption and delays to the working day in the short-term. In the long-term, however, it allowed for a much more streamlined, efficient and productive factory. Another element of lean management is kanban, meaning “signboard.” Kanban is simply a visual system that allows all workers to easily see and understand what is needed and when (Aguilar-Escobar, Bourque, and Godino-Gallego, 2015). In the original context of the Toyota factory, kanban referred to physical cards that were deposited in boxes as a physical, visual way for one part of the production line to request parts from another. The kanban system upheld an important part of the Toyota philosophy, which was just-in-time production, or “JIT” (Monden and Ohno, 2011). Producing parts on an ad-hoc, as-needed basis is an important part of minimizing waste, and would be very difficult without a system such as kanban for making requests quickly and clearly. How did the Toyota Production System spread outside of the car manufacturing world? Management experts became fascinated with the system and its novel philosophies like just-in-time, kaizen, andon and kanban. John Krafcik (1998) first coined the term “lean” to describe the process in his article for Sloan Management Review, called Triumph of the Lean Manufacturing System. Throughout the 90’s, the term lean and its philosophies started to percolate throughout the manufacturing and business worlds. The Toyota principles proved flexible and robust enough to benefit a variety of organizations, not just automakers. In 2011, Eric Ries (2011) wrote a book called The Lean Startup, which applies the principles of continuous improvement and customer-centrism to entrepreneurship. There is much confusion in the project management world between lean and another popular philosophy called agile. Lean has its origins in the Toyota Production System and focuses on continual optimization of an existing process to eliminate waste and respond quickly to market needs (Womack & Jones, 2003, cited in Aguilar-Escobar, Bourque, and Godino-Gallego, 2015, p.102). Agile originated in Silicon Valley and focuses on releasing products into real-life testing conditions as quickly as possible, minimizing bureaucracy, and fast decision making. The confusion between lean and agile is warranted, as they both entail continuous improvement (albeit with different rhythms), ruthless prioritization, responding quickly to market needs, and unlocking the latent productivity and creativity in each individual team member. Agile, often confused with lean, is a framework for managing projects which comes from the software development world. Agile project management can be executed using a variety of possible techniques such as scrum, extreme programming, adaptive system development, or even kanban, just to name a few (Cohn, 1998). The philosophy was born from a group of software practitioners who, at the dawn of the digital age, observed that great software can not be created in the tidy sequential order implied by a traditional waterfall-style hierarchy. The group of seventeen software practitioners met at a ski resort in Utah in February 2001 to discuss “lightweight” software development methods (it wasn’t until the group convened that they chose the term “agile” as a more descriptive name for their philosophy (The Agile Alliance, 2001). The group called themselves The Agile Alliance, and at their Utah summit they produced a document called The Agile Manifesto (above), which is only nine lines long. The reason why good software can’t be made in a traditional waterfall management environment is because software is more like a living thing than a man-made object. Software is interactive: it acts and reacts, and must be updated and maintained over time. Like an evolving organism, software must be continually improved to survive. Figure 6/7. The 20th century workplace strove to emulate machinery while the 21st century workplace strives to emulate natural systems. “Survival” for software entails things like compatibility with the latest hardware, security against the latest viruses and cyber threats, ability to exchange data with other, also-evolving pieces of software and compliance with changing legal requirements. Scrum is one well-known method for executing agile philosophies. It uses a specific process of sprints (short work cycles), scrum boards (visual task delegation and tracking, not unlike kanban), burndown charts (for productivity tracking), standups (daily planning meetings) and retrospectives (review of the process itself). This blend of techniques is designed to keep a team communicating, moving forward, improving processes, and delivering continuously. A scrum board mid-project at Hyper Island. RO first emerged in the 1990’s from the observation that industrial-era management wisdom was quickly becoming obsolete. It wasn’t until around 2010 that these philosophies (both agile and RO) would make their way from the pages of management journals into the testing grounds of real-life practice and recognition. Other examples of movements like Lean and Agile tended to include a lot of specifics about what that meant. Instead of creating another set of detailed models for how to become and run a responsive org, we wanted it to be an umbrella term that helped people realized that Lean, Agile, and Networked can refer to the same thing [sic]. It was really about connecting people more than dictating a specific path. Since 2013, the RO movement has grown to a global scale and has groups of passionate supporters in cities all around the world. The RO movement also has a manifesto published online. The manifesto emphasizes six attitudinal shifts (which it calls “tensions”) which it claims are necessary for organizations to survive and thrive in the 21st century (Responsive Organizations, no date). The first and most important shift is from “more predictable” to “less predictable.” As the pace of change in the world accelerates, thanks mostly to digital technologies, organizations must design for decision-making in a tumultuous social, economic and cultural context that is not easily predictable. The third shift is from “controlling” to “empowering.” Contemporary management wisdom eschews centralized command-and-control-style decision-making, and instead seeks to leverage the untapped potential in teams and individuals by disseminating decision-making power throughout an organization. This theme repeats throughout all of the philosophies and techniques covered in this paper — not just RO. The fourth shift is about moving from “planning” to “experimentation.” As unpredictability increases, the value of long-term planning decreases. Instead of creating perfect plans, organizations should instead optimize for learning, flexibility and ability to pivot based on new data. The fifth shift is about moving from “hierarchies” to “networks.” This section talks about the outdatedness of chains of command, appropriate for industrial-era production but unnecessary for contemporary knowledge work. Twenty-first century technology and communications tools allow for less linear structures of collaboration, which in turn allow greater autonomy for each team and for each individual within an organization. The final shift discussed in the RO Manifesto is about moving from “privacy” to “transparency.” In the information age, it no longer makes strategic sense to guard intellectual property and trade secrets in the way it did before. Now that communication is easier and information is more accessible, opportunities for cooperation outweigh those for theft. This specific point about transparency seems unique to the RO philosophy. Other approaches (such as agile and Holacracy) imply the renewed importance of transparency in the post-digital age, but none of them explain it as clearly and directly as does the RO manifesto. Aguilar-Escobar, V.G., Bourque, S. and Godino-Gallego, N. (2015) ‘Hospital kanban system implementation: Evaluating satisfaction of nursing personnel’, Investigaciones Europeas de Dirección y Economía de la Empresa, 21(3), pp. 101–110. doi: 10.1016/j.iedee.2014.12.001. Cohn, M. (1998) The Scrum agile process: Learn about agile and Scrum. Available at: https://www.mountaingoatsoftware.com/agile/new-to-agile-or-scrum (Accessed: 17 June 2016). Coulson-Thomas, C. and Brown, R. (1989) The responsive Organisation: People management: The challenge of the 1990s (The Institute of Management Reports). London: British Institute of Management. Doyle, A. (2016) ‘Management and organization at Medium’, The Story, 4 March. Available at: https://medium.com/the-story/management-and-organization-at-medium-2228cc9d93e9#.fs7n3iuhx (Accessed: 10 June 2016). HolacracyOne, LLC (2016a) Holacracy Constitution. Available at: http://www.holacracy.org/constitution (Accessed: 10 June 2016). HolacracyOne, LLC (2016) Holacracy: How it works. Available at: http://www.holacracy.org/how-it-works/ (Accessed: 10 June 2016). HolacracyOne, LLC (2015) What is the Holacracy Constitution? Available at: http://www.holacracy.org/wp-content/uploads/2015/07/Holacracy-Constitution-v4.1.pdf (Accessed: 10 June 2016). Krafcik, J. (1998) ‘Triumph of The Lean Production System’, Sloan Management Review, 30(1). Microsoft (2016) The Responsive Organization. Available at: https://www.youtube.com/watch?v=jnmr8zvomE8 (Accessed: 18 June 2016). Pisoni, A. (2013) Origins of the term responsive Org. Available at: https://docs.google.com/document/d/11N3ZJb9tYXgA1rXw1nl4qFQKWgOj9pN8xlGcHcNhCS0/edit (Accessed: 9 July 2016). Pisoni, A. (2016) ResponsiveOrg Slack Group, Chat Communication, 20 June. Responsive Organizations (no date) Manifesto. Available at: http://www.responsive.org/manifesto (Accessed: 20 June 2016). Ries, E. (2011) The lean startup: How constant innovation creates radically successful businesses. London: Portfolio Penguin. Robertson, B.J. (2015) Holacracy: The new management system for a rapidly changing world. United States: Henry Holt & Company, p.12. Savage, C. (2015) ‘Ditching flat: How structure helped us move faster’,Wistia Blog, 15 October. Available at: https://wistia.com/blog/ditching-flat (Accessed: 9 June 2016). The Agile Alliance (2001) The Agile Manifesto: History. Available at: http://agilemanifesto.org/history.html (Accessed: 17 June 2016). This American Life, 2010. NUMMI [podcast]. 26 March. Available at: http://www.thisamericanlife.org/radio-archives/episode/403/nummi (accessed 17 June 2016). Valve Software (2012) Handbook for New Employees. Available at: http://www.valvesoftware.com/company/Valve_Handbook_LowRes.pdf (Accessed: 9 July 2016). Wheelan, S.A. (2015) Creating effective teams: A guide for members and leaders. 4th edn. Thousand Oaks, California: SAGE Publications. Pexels (2013) Waterfall. Available at: https://www.pexels.com/photo/waterfall-lake-adventure-nature-6955/ (Accessed 17 June 2016). Valve Software (2012) Valve Organizational Structure. Available at: http://www.valvesoftware.com/company/Valve_Handbook_LowRes.pdf (Accessed: 9 July 2016). HolacracyOne LLC (2016) How Holacracy Works. Available at: http://www.holacracy.org (Accessed 17 June 2016). Monden, Y. and Ohno, T. (2011) Toyota production system: An integrated approach to just-in-time, 4th edition. 4th edn. Boca Raton, FL: Productivity Press, pp. 215, illus. The Agile Alliance (2001) The Agile Manifesto. Available at: http://agilemanifesto.org (Accessed: 17 June 2016). James Albert Bonsack (1881) Cigarette rolling machine. Available at: https://commons.wikimedia.org/wiki/File:Bonsack_machine.png (Accessed: 20 June 2016). U.S. Army Corps of Engineers Digital Visual Library (no date) A scene in the Atchafalaya Basin in Louisiana, USA. Available at: https://commons.wikimedia.org/wiki/File:Atchafalaya_Basin.jpg (Accessed: 20 June 2016). Microsoft (2016) Video still from The Responsive Organization. Available at: https://www.youtube.com/watch?v=jnmr8zvomE8 (Accessed: 18 June 2016).